Good morning, Friends! It's good to be back home! I had done a few pre-posts before I left. And that was a good thing as we didn't have free internet at the hotel. I was able to tweak a few things while I was in Las Vegas because we found a Starbucks and had some time but that was it. So now I am back to my routine - yeah! The tournament was another tough one. The boys played great!! I can't complain there! And of course, we all had a great time being in Vegas! So much to see! Sensory overload - lol!! Now we are back and it's time to get into the routine. Pretty easy card and one that I thought was a little more masculine. Thanks for stopping by and have a super day! Very fun card! 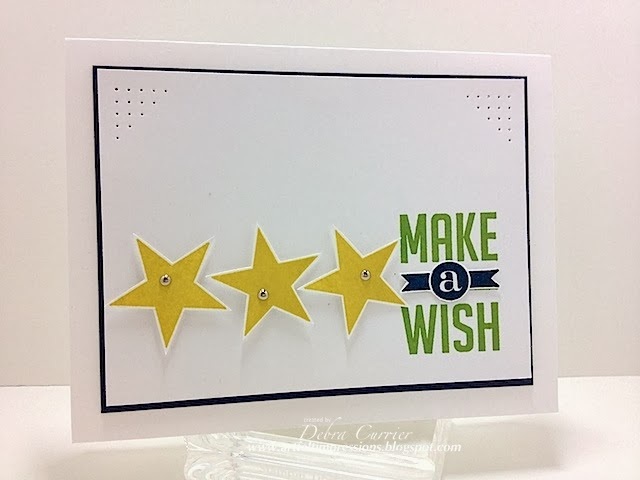 You definitely need to enter it in my CAS star challenge at the Paper Players this week, too! Love the piercing in the corners, too! Deb, you are the QUEEN of CAS! Love this! The colors pop against all the white space and I love, love, love how you've done the sentiment. So glad you could join us at The Paper Players! Great CAS design - the stamping is so sharp and the colours really do pop off the page!